The day began later than in previous I&E events. It was a reasonable noon hour before the Rhode Island Convention Center bustled with life. At 11:45 a.m., a lone snare from Blue Devils B played to the picturesque day, oblivious to the cars and pedestrians. Inside, DCI and S.O.M.E. (Sponsors of Musical Enrichment) crews put the final touches on the venue. The Fastest Drummer drew considerable crowds as the day progressed. Woodwinds debut at 2005 I&E Tucked away at a small meeting room, Cavaliers director and DCI board president Jeff Fiedler made sure the competitors had music stands. Fiedler was making sure this new event (woodwinds) was given a good start -– after all, he was the board member who sponsored its creation. "Dan [Acheson] wrote it, I sponsored it, and the board passed it," he said. At precisely noon, judge Chuck King welcomed the small crowd to the historic first woodwind I&E competition. Four performers tested the waters: Two saxophones, an oboe and a flute. King, a DCI percussion judge, has been a band and woodwind ensemble director for years. "This is exciting to have something new at I&E. It gives kids a chance to show their artistic ability and musicianship," King said. 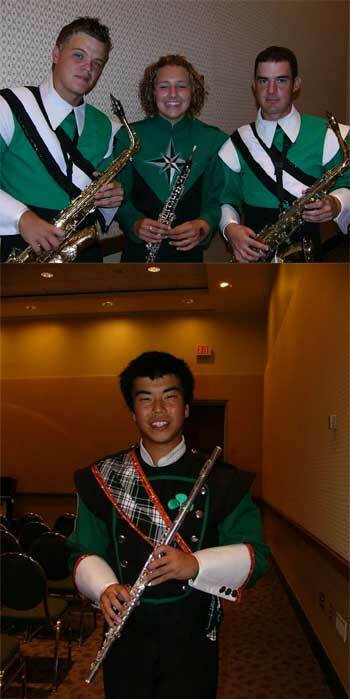 (Top) The two Cavalier sax players with Christine, the timp/oboe player from Oregon Crusaders; below, Samuel Karafotis from Pioneer (he received the highest score in woodwinds). First up was Errin Paulls, normally a Cavaliers baritone, who played "The Crescent Sonata, Mov. 3," by Paul Crescent, on saxophone. He earned a second place with 96.5. In first place with a 97.5 was Jay Mendoza, also a Cavalier baritone-turned-saxophone. Pioneer produced flute player Samuel Karafotis, whose lyrical interpretation earned a high 98.00. Oregon Crusader timpanist Christine Bedard played "Con Pastorale" on oboe. She introduced her piece by lifting her instrument and saying, "This is an oboe for all you brass players out there." King laughed and responded, "This is probably the first time in DCI history that we've had to introduce an instrument." Bedard earned a 97.5 "We can only grow from here," Fiedler said. "We want to involve the performers whose principle instrument is woodwinds. This gives them a chance to shine in front of their peers. I know this particular event will quadruple in size next year." Noting that this event seems a stretch for many drum corps fans, Fiedler adds, "I don't think anyone should be overly concerned that we're changing the basic nature of our activity. We're just offering more opportunities for our musicians." In the end, virtually every performer walked away a winner. The woodwinds were judged on their own instruments. Only the Cavaliers gentlemen competed against each other.